Just as we have a pattern when we go through with life, which starts from birth and ends in death, we also have a separate pattern for our work life. This work-life pattern doesn’t begin when the person starts looking for a job, it actually begins just as the person reaches the end of their student life. When the person becomes employed, they will then enter the training and then the regularization phase, after which they will be able to enjoy the benefits that come with their job. After years of providing service to their employers and the company as a whole, they can then choose to end their employment to proceed to a different one, and this is referred to as resignation. On a different note, especially if they reach a certain age and want to fully end their work life, then they can choose to retire. Resignation and retirement are two different things, with the only common denominator being the end of a person’s employment. While resignation is only temporary, retirement is a permanent cessation of work and is commonly done by people when they get to a certain age. Since retirements mark the end of a person’s life as an employee, this usually calls for a celebration or a party and is usually attended by the retiree’s colleagues, family members, and closest friends. And of course, in every event (especially surprise parties), there should always be careful planning involved that the honoree will know nothing or only little about. During the planning phase, the hosts or organizers of the party will need to spread the word to people for the party to gain attendees, and this can be done by sending out invitations. As obvious as it gets, this type of invitations are collectively known as retirement party invitations. 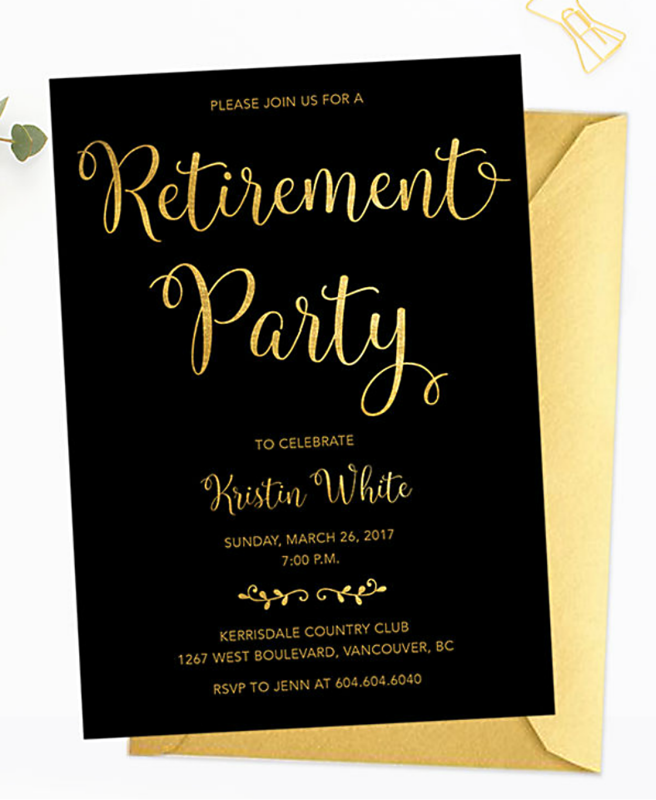 And while people can always choose to make their own retirement invitations out of nothing, they can also choose to make these by using pre-designed templates that can download from the Internet. 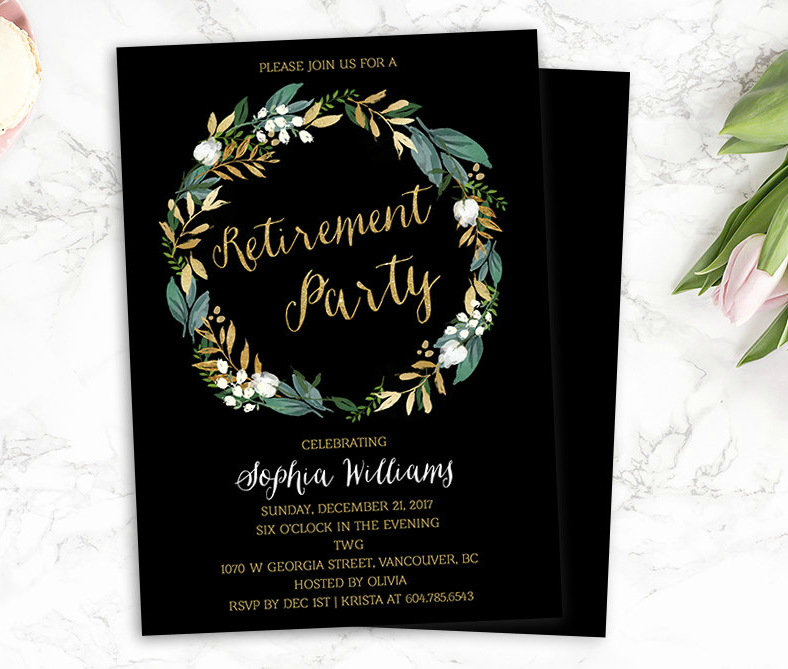 If you want to save yourself the stress of having to design retirement invitations from scratch, we have an entire collection of some of the best invitation designs below that you can check out. Go ahead, don’t be shy. 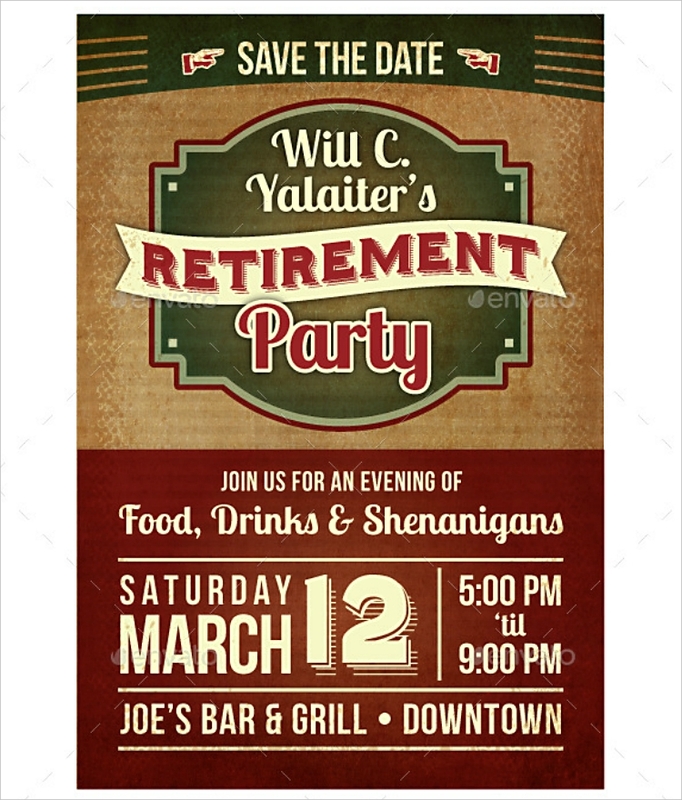 Check out the first retirement party invitation design on this list brought to you by a graphic artist named Julie Felton, which focuses more on the typography than graphics and other elements. This invitation design also has a touch of retro to it as evidenced by the low contrast in the colors, and this makes the design even more interesting and beautiful. To make it easy for people to read the details on this design, the contents are divided into sections, and for people to distinguish these, each section has different background colors. 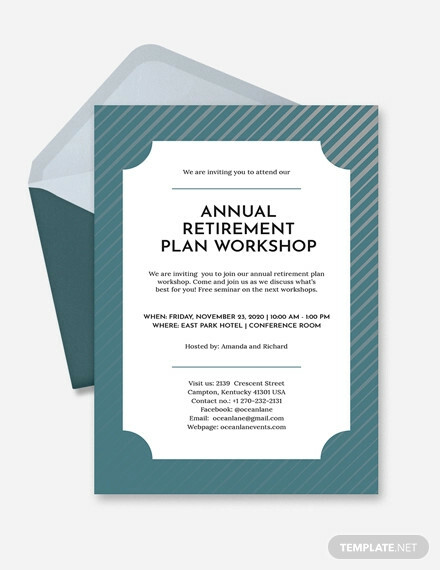 Having a solid-colored background for an invitation design is already good enough, but why settle there when you can always take it up a notch? 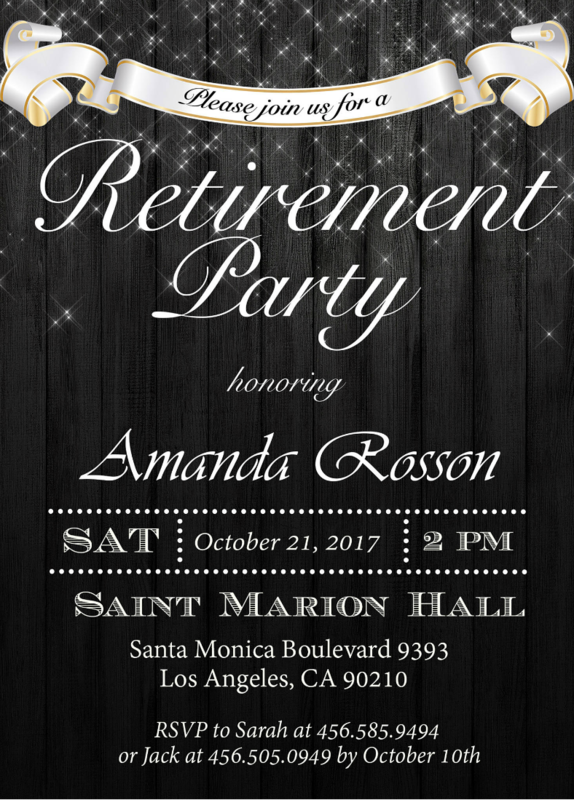 For the retirement invitation shown above, the background bears a rustic or wooden theme that is able to enhance the quality of the design. When using textures or patterns as background designs, just make sure to use contrasting colors between the text and the background to make it easy for people to read. Here is another event invitation design that contains an image of wooden planks for its background, but unlike the previous design on this list, this one has a black-colored background that gives this design a monochromatic appearance. Same as the previous design, this one focuses on the text rather than other types of graphics. As you can see from the design above, the text color used is white, which effectively contrasts with the dark background. 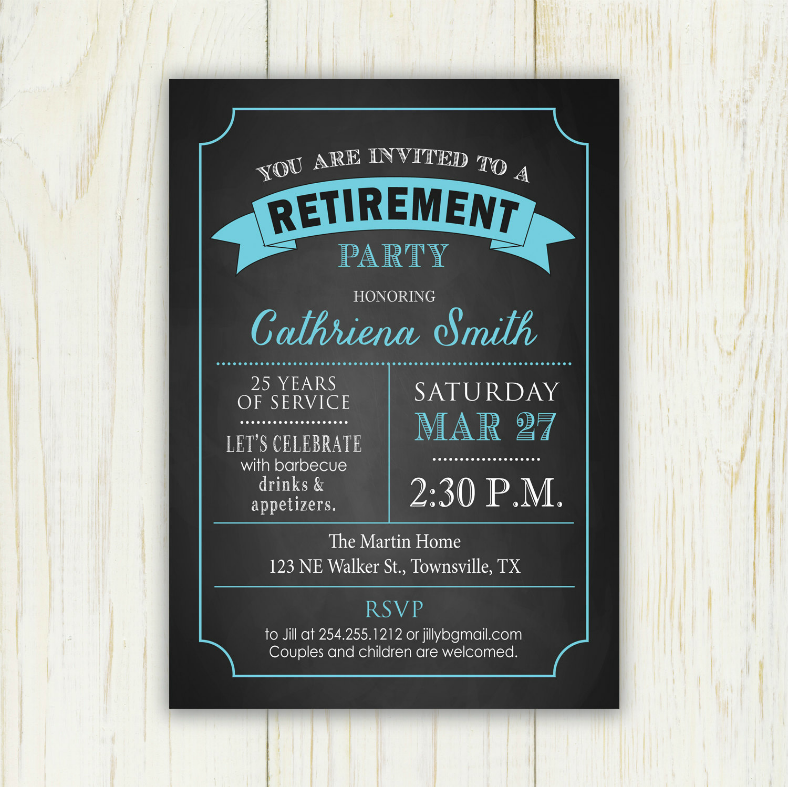 There is always something about chalkboard designs that make them stand out from the more modern ones, and the chalkboard-inspired retirement invitation design above is no exception. While many people may think of this design as very simple (which it is), but its simplicity is one of the best qualities of this invitation design. That said, even with this formal invitation’s simple design, you can already determine the level of excitement applied to it as evidenced by the beer mugs illustration on the top portion of the design, and also the choice of words for the text. People often associate luxury with extravagance and being over the top, but that is not the case at all times. Sometimes, being luxurious can also be associated with simplicity, and the same can be said when it comes to designs. With proper balancing between simplicity and fancy features, the proper use of colors, and also the choice of typeface, a minimalist design can also be luxurious. 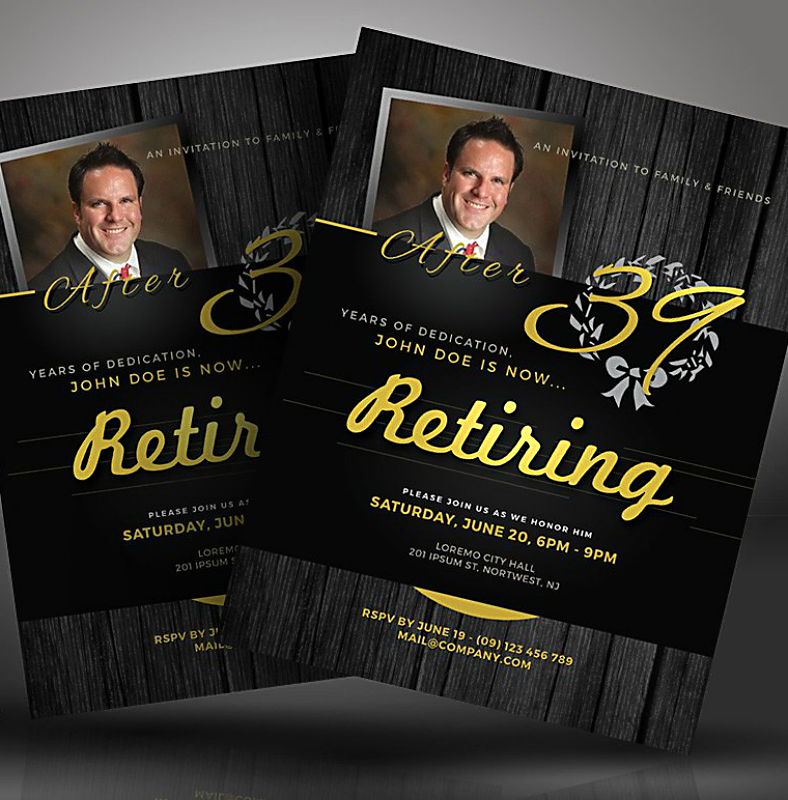 As you can see from the invitation flyer design shown above, this retirement invitation contains a solid black background and focuses more on typography with only a very minimal amount of decorative graphics added into it. 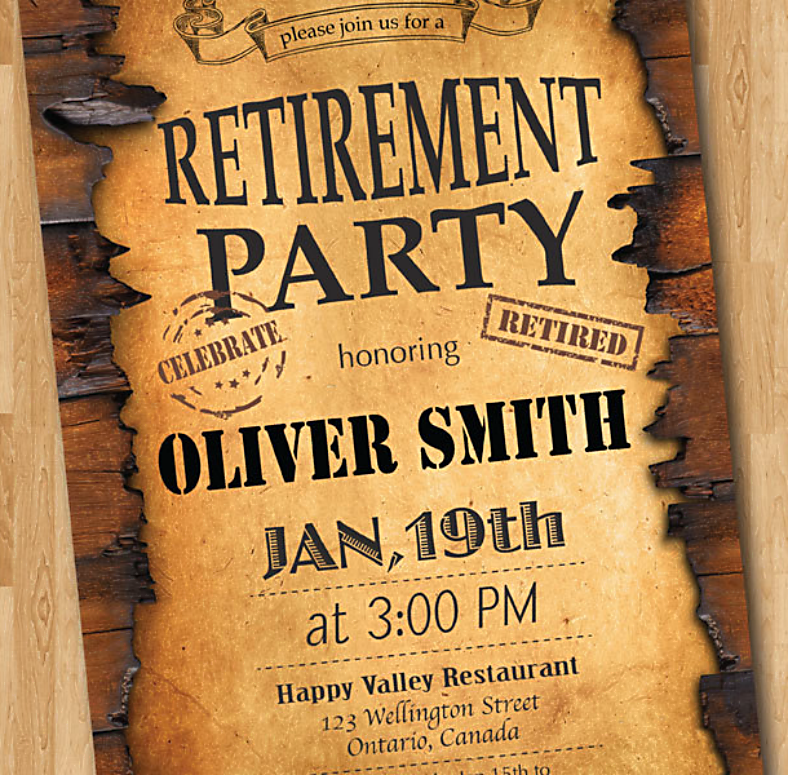 Here is another retirement invitation design that focuses more on text rather than other graphical features, but unlike the previous one that had a similar style, this design leans more toward being rustic than being luxurious. As seen from the image above, this design resembles a file as evidenced by the rust textures on the background and the stamp elements. Aside from just being the people who teach us the lessons that we need to know in life, teachers also serve as our parents in school. Teachers also look after us and ensure that we don’t get ourselves in trouble while we are in school. Because of this, teachers are being honored annually, and this event is referred to as Teacher’s Day, which is celebrated every fifth of October. When teacher’s retire, the more they are even celebrated by their co-teachers, their pupils, and even the parents of their pupils. The retirement invitation design above is intended for teachers who finally decide on retiring after years of teaching children. 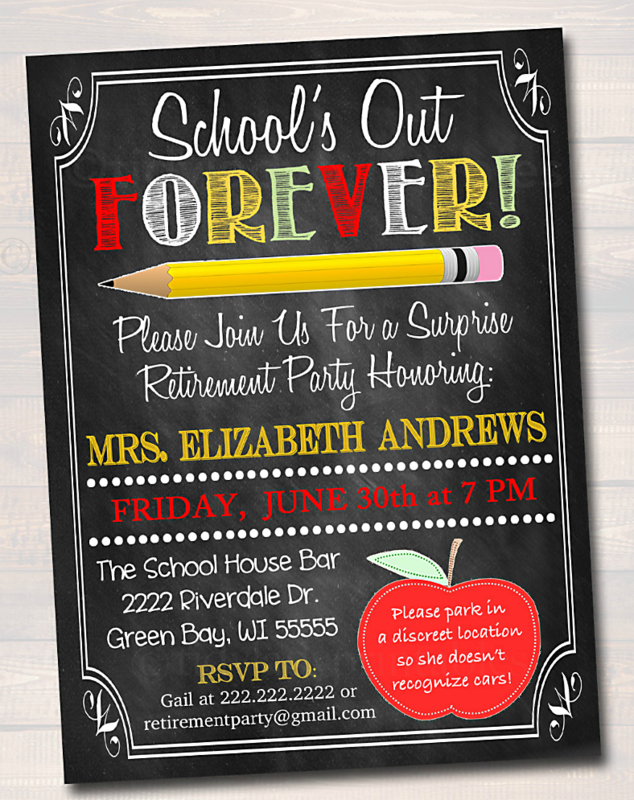 To make the party invitation design even more appropriate for the retiree’s profession, the theme of the design is inspired by chalkboards, which is the teacher’s most common instructional tool (before the existence of whiteboards, that is). Honor your teachers and let them know how much they mean to you by throwing a party for them and using the design above for formally inviting people. 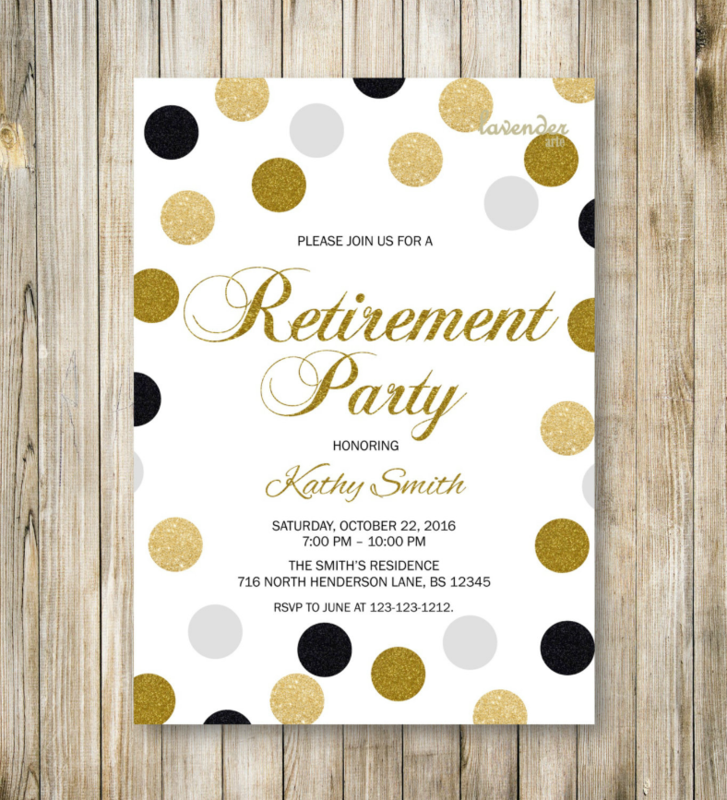 Here is another luxurious retirement invitation design that you might also be interested in, but unlike the previous one that leaned more toward minimalism, this one has some added elements to help enhance the quality. The decorative elements on this design resemble dots that appear to consist of glitters, and these dots are randomly placed all over the design. Then again, this design maximizes its use of white space to make it easy to read and also to avoid the design from looking overly cluttered. 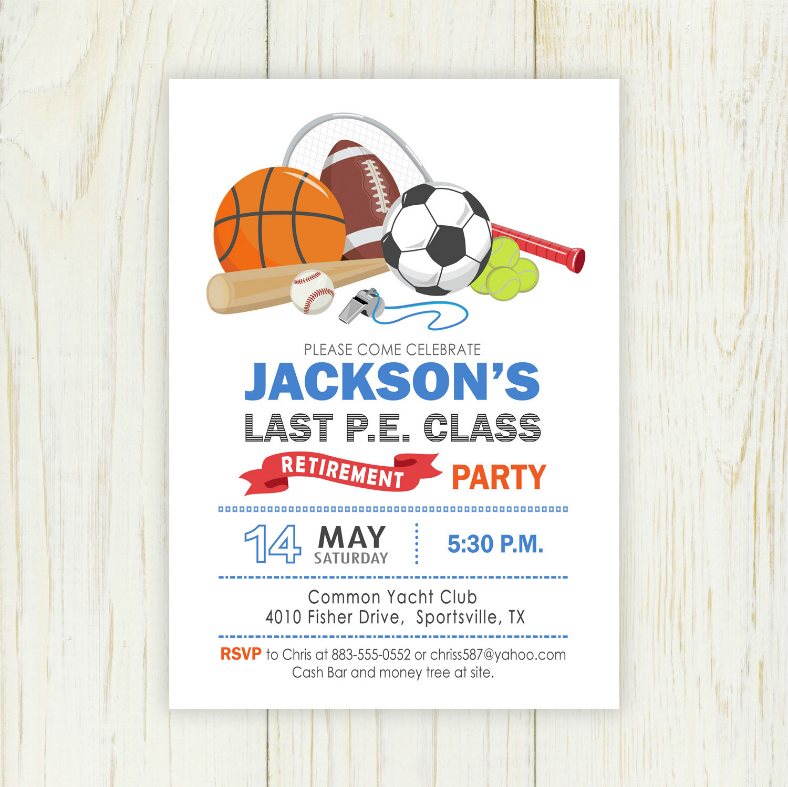 Take a look at the wonderful retirement party invitation design above, which contains a colorful border. If you look closely at the design, the border is actually the world map, which is used as the main decorative feature of this design. In the middle portion, all text and details are written over a white background, and this helps in making the content easy to read. 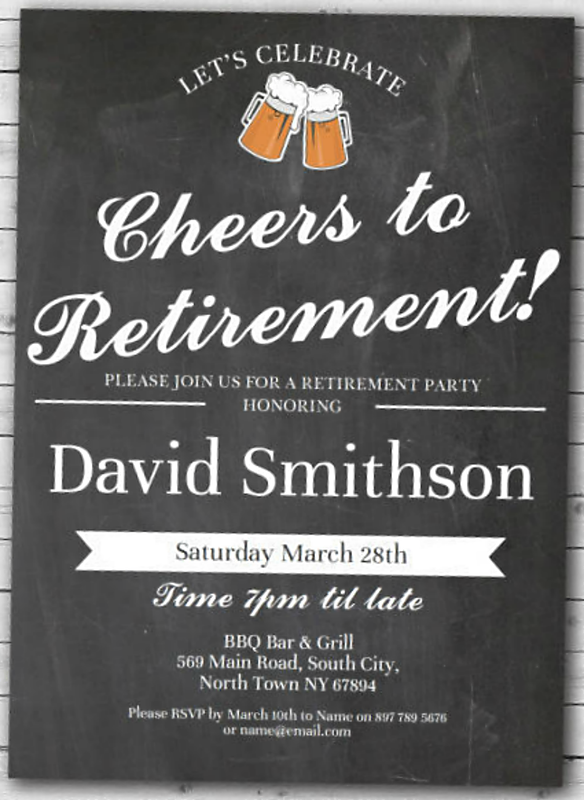 The retirement party invitation design above is a good example of one that is able to balance between minimalism and being artistic. The simple features of this design include the fact that it focuses more on text and the solid black background. On the other hand, the artistic features of this design include the script font used and the colorful wreath added as a decoration. 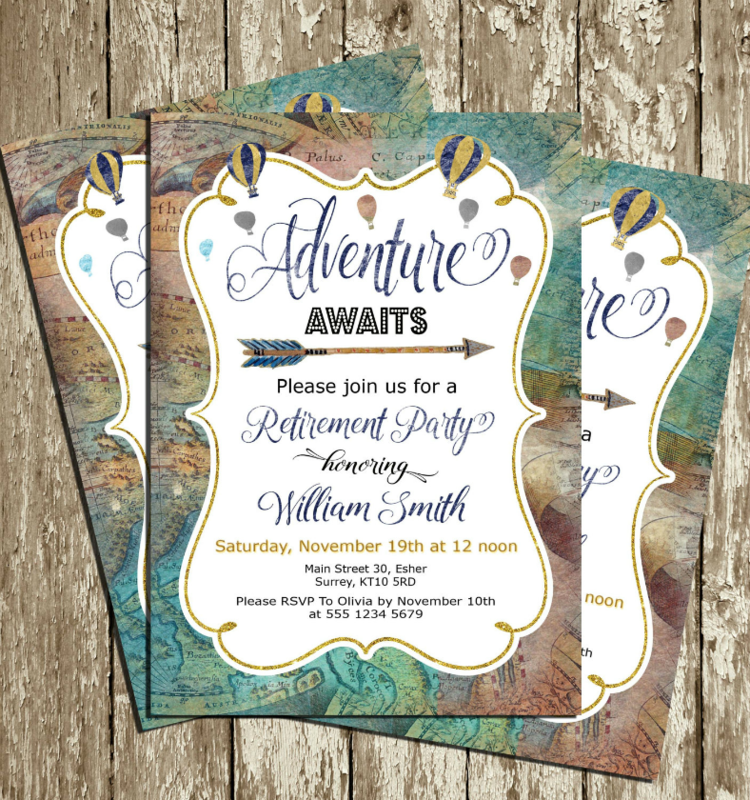 If you enjoy watercolor art or handwritten-inspired designs, then for sure, you will also enjoy the retirement invitation design above. As you can see from the image above, the floral pattern that serves as the upper border and the text appear to be drawn and written respectively by hand. And aside from just appearing to be done by hand, these elements also appear to be done using watercolor paint. If you are planning for a colorful theme for the party, then this invitation design will do perfectly. 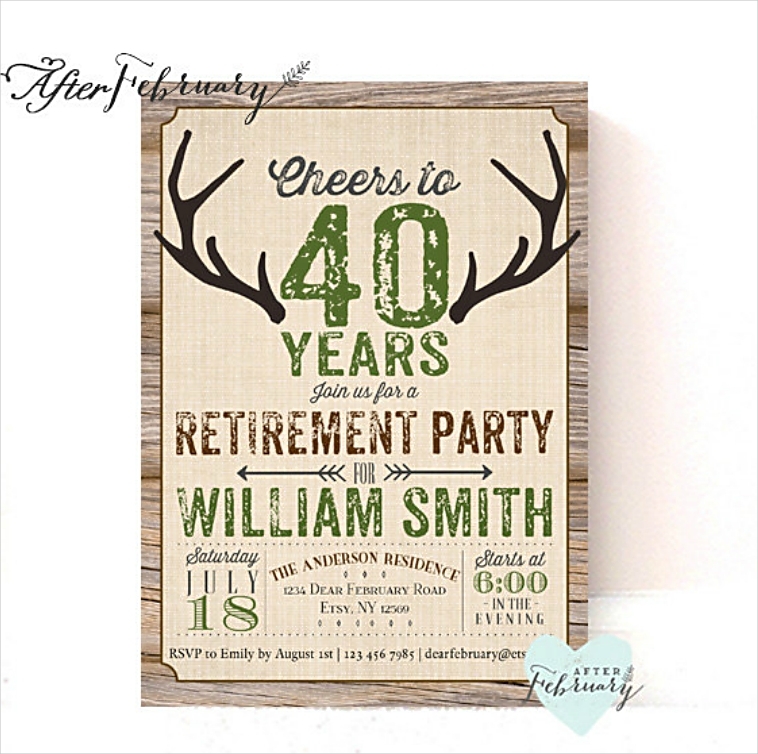 Previously, we have shown you a rustic-themed retirement party invitation design that resembled a file. The design above somehow looks similar to that design, but with some added effects. As you can see from the image above, the edges of the file appear to be unevenly burned and placed over wooden planks, and the latter serves as the design’s border. Just like the last design that had a similar style to this one, this invitation design also contains stamp marks that further makes it look like a genuine rustic document. 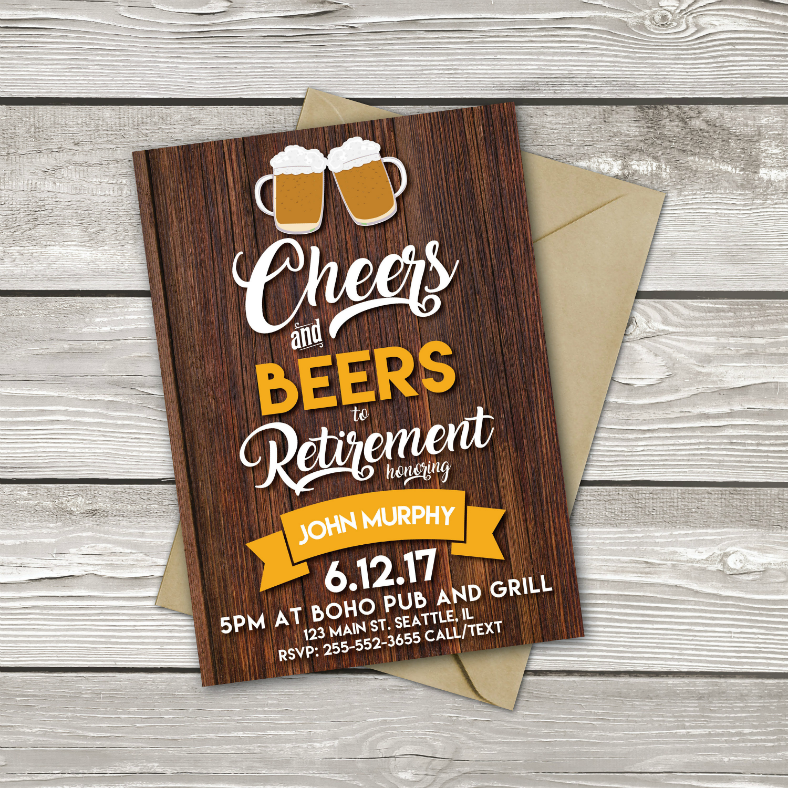 After all the invitation designs that you have just seen, by now you have probably picked at least one that may work appropriately for the retirement party that you are organizing. If not, you may also want to check out our separate page for party invitations that are in the PSD format. It is best that when choosing a design, you should take into consideration the theme of your party and whether or not the invitation design fits appropriately into it. Another thing that you may consider are the interests of the retiree, and you may choose to incorporate those into the design. And, you may also take into consideration the amount of information that you are allowed to write on the invitation, though many of the designs above allow you to either add or remove some details, depending on your preferences. 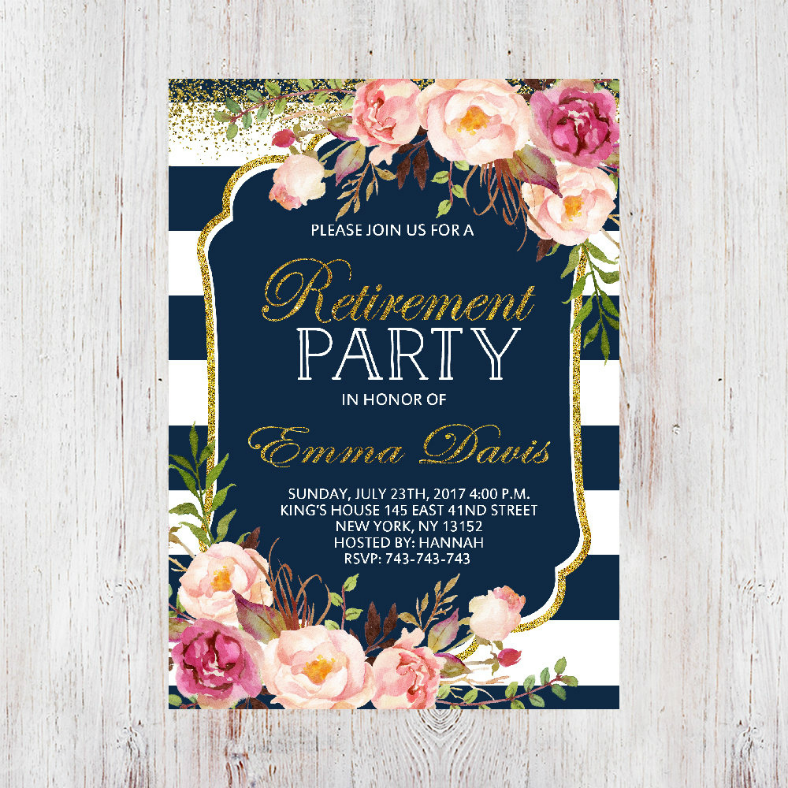 With regards to the designs that you have just seen, they were all gathered from multiple websites that offer more than just designs for retirement invitations. 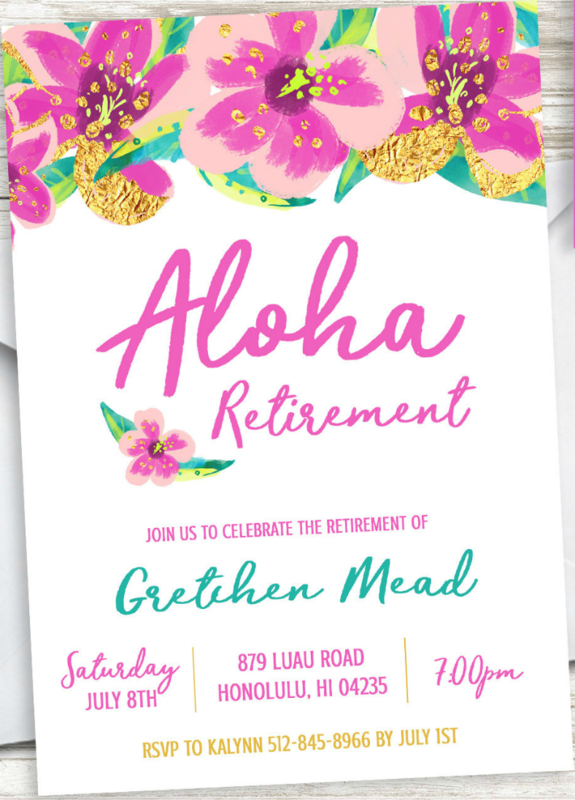 For the people who designed these retirement invitations, they are some of today’s best and most talented graphic artists from all over the world, and they contributed these designs to provide people with a less stressful means of making their own professional-grade retirement invitations. These designs are mostly made using vector graphics, which not only assures you of sharp resolution but also of full and easy editability. 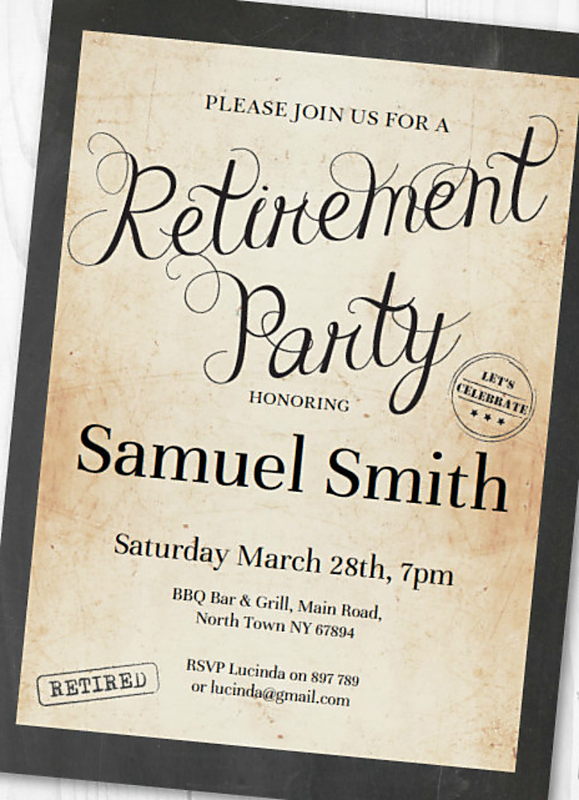 Finally, to answer many people’s inquiries regarding “the catch” of downloading these retirement invitation designs. While we can honestly say that these cannot be downloaded for free, we would also like to make it clear that you will only be paying a reasonable amount for these designs, we may even guarantee that you will be getting more than what you’re actually paying for. 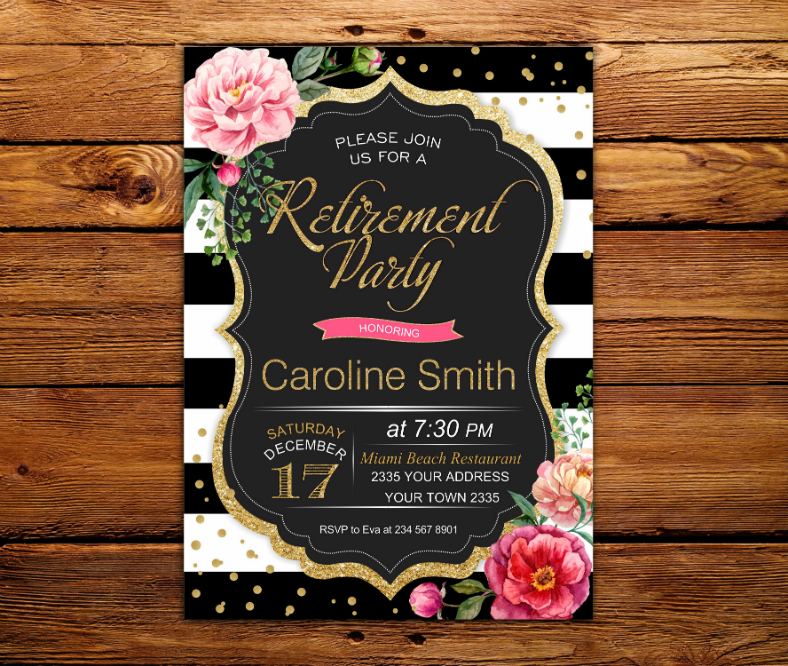 Downloading these designs can be done very easy as long as you have a stable Internet connection, and if you are already familiar with the steps on how to design party invitations, go back up and download your own retirement invitation design now.